Jalesveva Jaya Mahe (in the sea we are glorious) is a slogan which gives a picture of Indonesian politics glory in the past, as the ocean sovereign. After several decades, the glory as the ocean sovereign goes down. President Jokowi’s regime that started to govern since 2014 began to reappoint “Jasleveva Jaya Mahe” in his countless efforts to make Indonesia as the world’s maritime spindle. From economy aspects, the potential of marine and fishery sectors of Indonesia are a very precious asset for development. 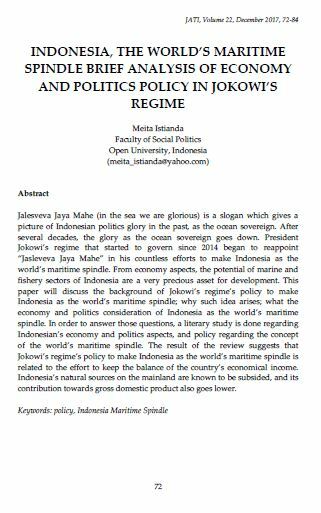 This paper will discuss the background of Jokowi’s regime’s policy to make Indonesia as the world’s maritime spindle; why such idea arises; what the economy and politics consideration of Indonesia as the world’s maritime spindle. In order to answer those questions, a literary study is done regarding Indonesian’s economy and politics aspects, and policy regarding the concept of the world’s maritime spindle. The result of the review suggests that Jokowi’s regime’s policy to make Indonesia as the world’s maritime spindle is related to the effort to keep the balance of the country’s economical income. Indonesia’s natural sources on the mainland are known to be subsided, and its contribution towards gross domestic product also goes lower. ISTIANDA, Meita. INDONESIA, THE WORLD’S MARITIME SPINDLE BRIEF ANALYSIS OF ECONOMY AND POLITICS POLICY IN JOKOWI’S REGIME. JATI - JOURNAL OF SOUTHEAST ASIAN STUDIES, [S.l. ], v. 22, n. 1, p. 72-84, dec. 2017. ISSN 2600-8653. Available at: <https://jati.um.edu.my/article/view/10247>. Date accessed: 20 apr. 2019. doi: https://doi.org/10.22452/jati.vol22no1.6.